Christmas creep, that delightful phenomenon that has the holiday starting earlier and earlier each year, is turning me into a bit of a Grinch, what with the Xmas-themed turn my Pinterest dashboard took, oh, about last JULY, and the obsessive need for people who weren’t hugged enough as children to start Elf-on-a-Shelf-ing in Mid-November. I love Christmas, but it doesn’t have to start this early. December 7th is a good day for it to start this year, in case you were wondering. 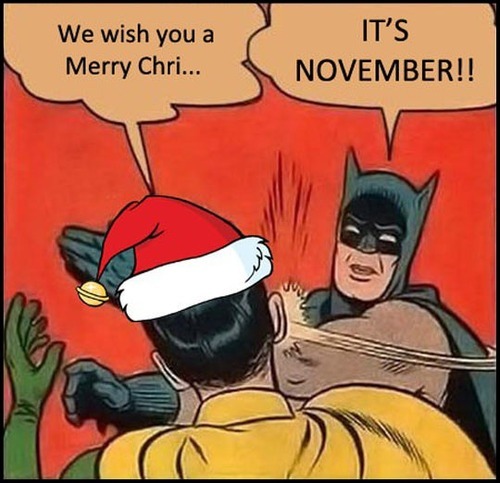 I don’t like Christmas creep because, like most normal people, I want to enjoy the holiday that comes before it, Thanksgiving. Like many moms, I made a pretty good 3-day action plan for my time this week, so that I could have a great long weekend with my kids, 16 lbs of turkey, and enough carbohydrate-based food products to induce a coma. I had a cleaning the house plan, and a prepping the meal in advance plan, all designed so that Wednesday night I could enjoy a cocktail and a movie in an immaculate house, knowing the next day would be an easy bit of cooking and a huge amount of eating. The 3 day action plan was based, of course, on my kids being in school this week. But this plan was thwarted when I realized that the school calendar that I have, the one the Board of Education gave me, had been sneakily updated after (a dirty trick, indeed, and not the first time this year it has happened) it was distributed, to reflect that tomorrow is, in fact, a day off for the kids, and my 3-day action plan had to be crammed into 2 days, a fact made even more difficult by the fact that I wasted most of Monday having to tell my husband how wrong he was about something, a snippy little marital moment that took all day and left me searching the kitchen for hidden chocolate. And for the record? He was so, so wrong, but every holiday season starts, for us, with the traditional Yelling At My Husband About Our Goddamned Christmas Cards For Chrissakes Already I asked You To Handle This Last July. That is a fight that falls in familiar territory, one so well-fought for so many years that we could probably switch places mid-fight and keep going without missing a beat. So that was Monday, and then I had one day – today – to get everything ready for Thanksgiving, but also to get the house ready for the Xmas season, which apparently starts on December 1st (or mid-November, if you follow the Pinterest-ers that I do), and I cannot get my act together today. Mostly because I would rather play a little CIV V and eat cookies instead of cleaning out my fridge and vacuuming the dust bunnies underneath the furniture. I love my kids, but I NEED that Wednesday back, an extra day of an empty house, to get it all ready so that I can have a few moments of tranquility on the holidays, too. As one of the World’s Cheapest People, I decided to buy a snow blower this week, after most of winter has passed us by, because at the end of the season they are really on sale (seriously – like, half off), and off to Amazon I went, because shopping for me is pretty much all online these days, what with the preferring to just wear yoga pants and t-shirts all day, and my general disdain for shoes and all. Was that enough of a run-on sentence for you? Feel free to give me a ‘revise and resubmit’ for this blog entry. We are expecting snow on Friday, lots of it, and I am sick of shoveling. I have shoveled so much snow in my lifetime, and we have two properties to shovel out. I thought this would be a nice surprise for my husband, this cute little snow blower, but as I searched around on Amazon to make sure it was really a good deal, and there wasn’t a better option, or a more powerful one, or one in a prettier colour, I discovered that not everyone defines ‘snow blower’ the way I do. Or sanity. Apparently, not everybody defines sanity the way I would, either. 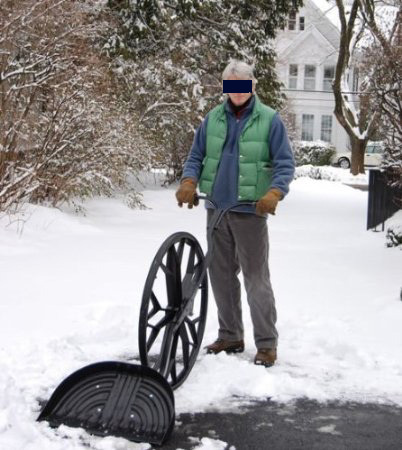 Some people, apparently, think a ‘snow wheel’ is a good idea. Judging by the number of positive reviews, a lot of people do. Crazy people. Crazy people who suggest, in their very long, positive reviews, that this is ‘better than a snow blower’. People like this guy, who sent in a user-photo, to demonstrate to other Amazon shoppers how thrilled he is with using his ‘Wovel’, as they are affectionately nick named. Because that isn’t crazy, naming your shovel. This guy didn’t put that black bar over his face: I did. Because much as I enjoy the winter wonderland of white privilege going on here, I can’t help but laugh. For real, is any culture as addicted to doing things the hard way as the WASPs are? 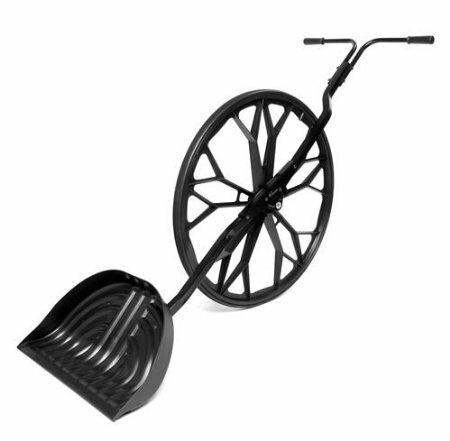 This … contraption … costs about $15 less than the multidirectional 18″ snowblower I just bought. But I am sure the satisfaction of using an implement designed in the 1600s is all he needs to keep him warm while he ploughs out his 100 foot driveway.This is exactly the kind of thing that appeals to the WASPy people who move to little towns like mine – an implement that has a better modern equivalent, costs a fortune, and might contribute to your next heart attack, but about which the user can use as a means to smugly attest to how green they are, how environmentally conscious, how slightly better than the rest of us a Wovel afficionado might be. I wish I had the kind of money that lets one buy ridiculous gag gifts for one’s loved ones. If I did, this thing would be under the Christmas tree of every person I knew. My husband would get two, one in pink. Gentle Reader, I would send you five, and one of them would be in a Lilly Pulitzer print. I just signed my girls up to play baseball this spring. Last year, in our old city, they missed the birthday cut-off date by one day, and nobody in the parks department was willing to bend the arbitrary date by 24 hours, even though they would not actually begin playing until a month later, when they would, in fact, be the correct age to play. There is nothing I loathe more than listening to an administrator explain how they won’t do something because, “…if I do it for you, I will have to do it for everybody.” No you won’t. There is no giant eye in the sky, scanning the cubicle farms of America, desperate to catch a low-paid paper shuffler in the act of being helpful and punishing them by forcing them to repeat that kindness over and over to millions and millions of people. Just tell the truth: you don’t want to help me because it might require effort. Ahem. Bitter about our old city, much? Why yes, thank you for asking. Our new town? The girls are old enough for baseball, and we are excited. Just reading the rulebook tells me we are in for a fun show, as parents. I know not everyone feels this way, but I love watching really little kids in action. I will happily go to your kid’s school play with you. For real. So much inadvertent comedy, so much earnestness. It is a great combination. A batter must use the tee after 5 pitches, whether or not the batter has swung at a pitch. The players may bat in any order as long as everyone receives a turn. Neither the score nor the number of outs are recorded. Who wouldn’t want to play baseball like this? You cannot strike out. Neither team can win. Everybody plays! I love this. Because at 5, when it is your first year of playing, why not make it more like a game, and less like a competition. Nobody gets a trophy in this league, there are no awards for anyone, and everyone gets the experience of standing at home plate on a warm spring morning, and swinging for the fences, even if the actual swing misses the ball ten times in a row. I hope they get t-shirts. I hope they love playing baseball. I already have a comfy folding chair, a water bottle, and the ability to slice oranges and put them in baggies, so I am confident in my baseball-parent skillset. I don’t have a fancy embroidered t-shirt, proclaiming me a “T-Ball Mom” though, so that might be a problem. I was looking for a graphic for this blog post and this is what popped up in image search – you can get an appliqued T-Ball Aunt t-shirt. 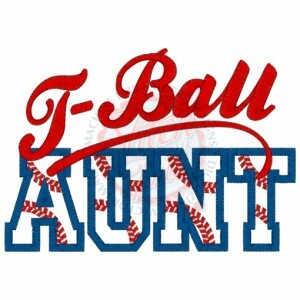 Is that a thing, now, being a T-Ball Aunt? Like, so much of a thing that there are t-shirts readily available? People, I will keep my eye out, and let you know.